This Chocolate Chip Pumpkin Mug Cake is the perfect treat if you’re single and enjoying a date night in with your significant other, or if you’re looking for a guilt-free dessert that is portion controlled! Fluffy in texture, packed with chocolate chips and perfect any time of the year. Let’s be honest, if you make a whole loaf or cake, you’re going to have more than one slice. Am I right? So why not enjoy the delicious things in life without worrying about devouring the whole damn thing in one night, either going to bed or waking up with a bit of regret. 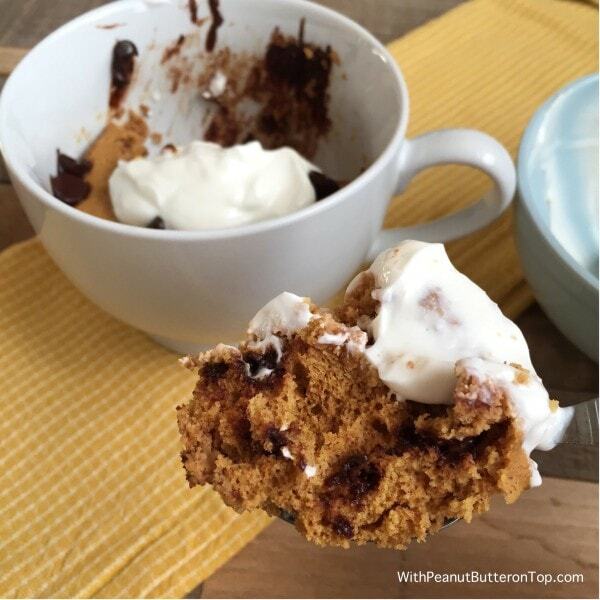 If this mug cake is too large for you, simply share it or cut the recipe in half. It is on the larger side of mug cakes, so it can easily be shared with a significant other if you don’t have an appetite for sweets like me! Feel free to use the chocolate chips of your choice, maybe add some nuts or swap the chocolate chips for white chocolate chips or even peanut butter chips?? Ehh, now we’re talking! 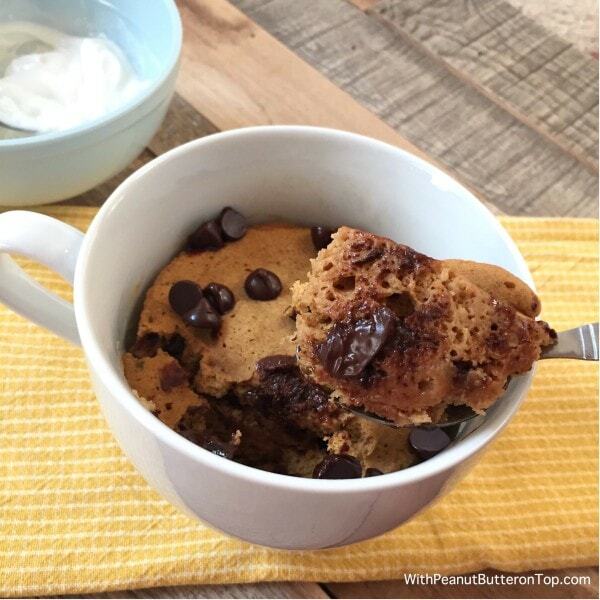 I mean… how can you say no to that spoonful of ooey gooey chocolate chips?? Part of me had a hard time waiting to get a shot before devouring what was on the spoon! And it only got better once the ‘Cream Cheese’ topping was added! If you haven’t tried substituting plain greek yogurt for the traditional cream cheese, then you need to! It is the perfect healthier alternative with only 3 ingredients! This mug cake is on the large size, so it can easily be shared between two people. 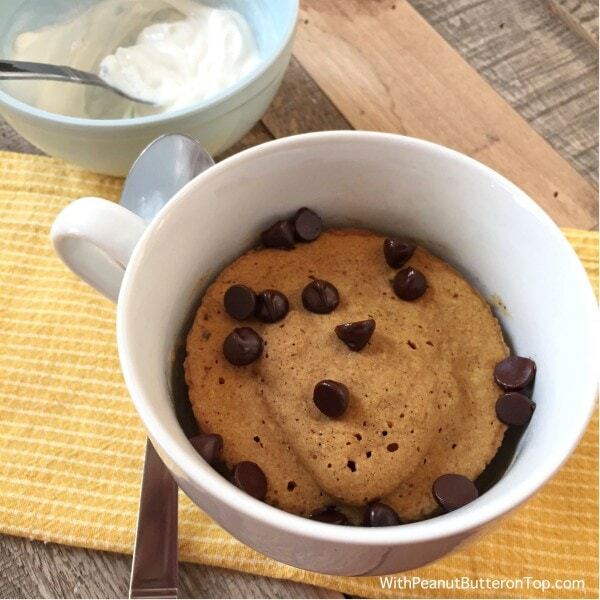 Or if you would prefer a smaller mug cake, simply divide the ingredients in half. This will help slash the calories, fat, sugar and carbs down and still be satisfying! 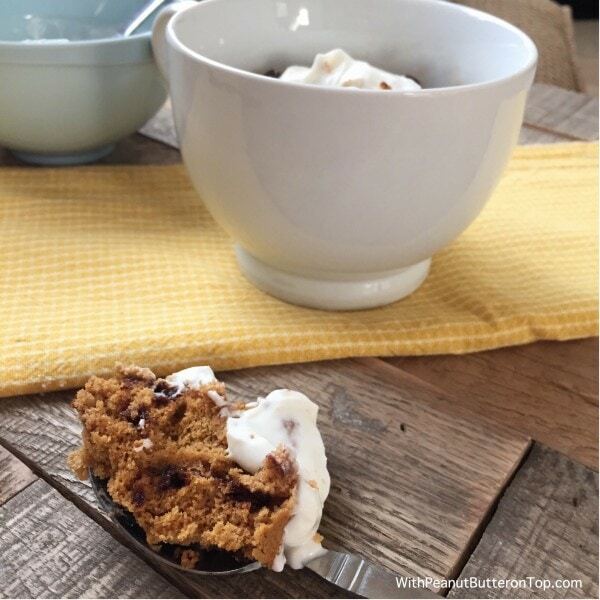 In a small bowl, combine oat flour, baking powder, salt, and pumpkin pie spice. Stir until combined. 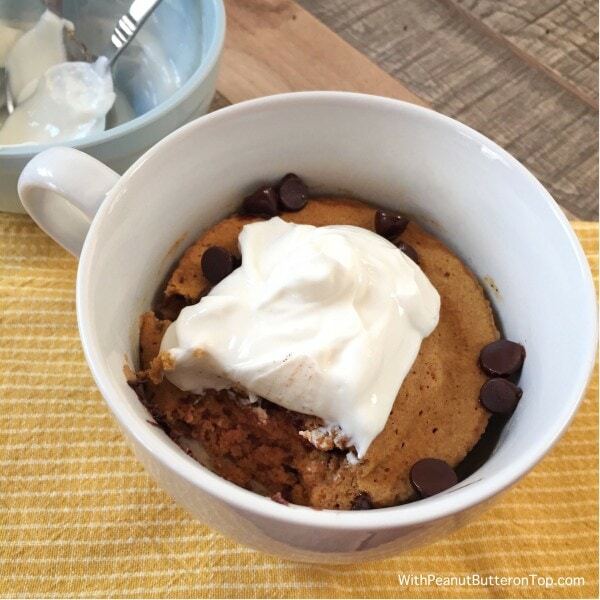 Stir in the sugar, milk of choice, egg white, and pumpkin puree. Mixing until no clumps remain. Fold in 1 tbsp. chocolate chips, reserving remaining for garnishment. Spray the inside of a mug with nonstick cooking spray and pour in the batter. Microwave on high for 2 1/2 to 3 minutes, or until the mug cake is cooked through. Place a toothpick down the center to check for doneness. The toothpick should remove clean. Sprinkle the top with remaining chocolate chips and enjoy! Can this be made in the oven instead of the microwave?? Looks way good but I don’t like to use the microwave! Hi Ellie! Yes, you can place it in the oven at 350 degrees F for approximately 15-20 minutes. Time will be dependent on the size mug or baking dish that you use, so check at 10-15 w/ a toothpick!